The Winnipeg if... Improv Festival is coming up very soon. It all starts on Tuesday, November 9th at the King's Head Pub as part of the Free Laughs Comedy show that happens every Tuesday night there. The opening show will be like a CRUMBS & Friends show... but on STEROIDS! Mostly because we will have some fabulous guests there to help make the show special. The Festival then continues with shows at the Gas Station Arts Centre for the rest of the week. The local underground comedy showcase. See the best local stand-ups and sketch comedians present their hilarity at the Gas Station. The Dungeons & Dragons live improvised show. Watch warriors, magic users and monsters battle it out for your laughs. Dice included. The Mainstage show featuring Rapid Fire Theatre (Edmonton), Outside Joke (Winnipeg) and Ghost Jail Theatre (Toronto) mash-up their improv shows. The Mainstage show features 4Track (New York City/Los Angeles) and CRUMBS (Winnipeg) join forces and destroy all things that aren't awesome! 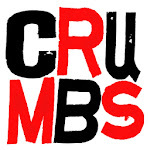 If you missed the CRUMBS radio show you can catch the podcast HERE. In the show we honoured June Cleaver from "Leave it to Beaver". We also learned a little from Eddy Haskell. We talked about New Zealand. We talked about the Improv Festival. We talked about the open mic comedy nights on Sundays at the Cavern and Thursdays at the Standard. We also talked about election time, which in Winnipeg is Oct 27th. We are really hoping that people aren't going to give Sammy another shot at owning our city. NO not this Sam Katz!